Hef takes a cue from commercial property owners… a new week of chart-chimpery… your last chance to watch this Jim Rickards video… and more! Go figure: The Federal Reserve has printed $3.4 trillion in new dollars since the Panic of 2008… and Jim Rickards says, “The world is suffering from a dollar shortage” that’s only getting worse. We resume our forecasts for 2016 this morning by updating one of Jim’s most prescient forecasts from a year ago — that the leading wave of a $14 trillion debt tsunami would become visible before the end of 2015. The short story: Companies in emerging markets loaded up on $9 trillion in dollar-denominated debt, assuming the dollar would stay weak forever. Meanwhile, U.S. energy firms loaded up on another $5 trillion in debt, assuming oil would sell between $80–110 a barrel forever. Both assumptions were shaky at the start of 2015, and steadily collapsed as the year wore on. Back to our paradox: “For every dollar printed by the Fed [since 2008], about 20 dollars of new debt was created,” says Jim. Yep. $3.4 trillion in new dollars from the Fed are overwhelmed by $57 trillion in debt the world racked up over the same time frame — including that $14 trillion in junk bonds Jim’s been warning about. “Not all of this debt is denominated in dollars,” Jim points out; “some is in yen, euros or yuan. 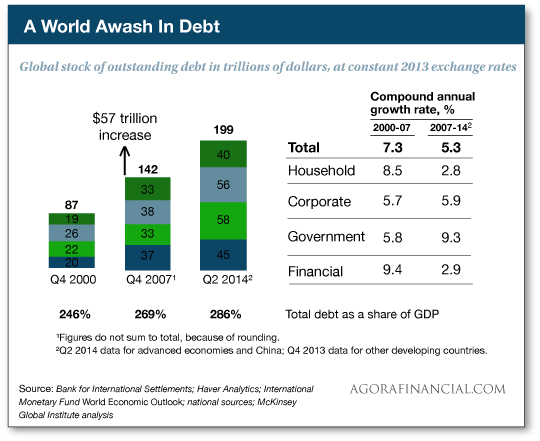 Still, the dollar debt overhang is enormous. After all, “Debt rollover requires new or existing investors to take new debt instead of cash,” Jim goes on. “For emerging-market debtors, this requires capital inflows from U.S. investors (and others with access to dollars, including European banks and sovereign wealth funds). But capital inflows have dried up. “The Fed’s policy of raising interest rates (which strengthens the dollar) has caused outbound capital flows to reverse. Investors are abandoning emerging markets and returning to the U.S. for higher yields in Treasury securities. Robust growth? No way. (We’ll get to that shortly in today’s episode.) Expanded credit? Not when the Fed has wound down “quantitative easing” and is raising rates. Restructuring? That means the banks and insurance companies that own the bad bonds would take losses. Yes, inflation is coming — despite seven years of failed efforts by the Fed and other central banks to create it. Late last year, we identified an initial drop of this “helicopter money” — the late-night budget deal struck between House Speaker Paul Ryan and other congressional leaders. It had $680 billion in new spending, or, to be precise, “targeted” tax breaks for special interests. As Jim said at the time, it’s too soon to jump into a pure inflation play, although gold should always be in your portfolio mix. “Yet those betting big on deflation may be caught on the wrong side of the trade if inflation kicks in sooner than expected.” We’ll stay on top of the situation as 2016 unfolds. Because of its time-sensitive nature, it comes offline at midnight tonight. Click here before we pull Jim’s message from the Web at midnight tonight. About the lack of “robust growth”: As we suspected, there’s less to Friday’s jobs numbers than met the eye. The headline number was 292,000 new jobs. But look out for those “seasonal adjustments,” says David Stockman, former White House budget director and editor of Bubble Finance Trader. Yikes. And the number of “breadwinner jobs” — jobs that pay $50,000 a year or better and can support a family — remains below levels of both late 1999 and late 2007. Another sign of economic weakness that feels a lot like late 2007 — Americans are taking on less debt than they used to. After we went to virtual press on Friday, the Fed came out with its monthly consumer credit figures. Balances on credit cards, student loans and auto loans grew $14 billion in November… but the “expert consensus” of Wall Street economists was figuring on $18.8 billion. That was enough to tank the market in the final hour of trading, pulling down the Dow industrials 130 points. To the markets today… where Scary Monsters are lurking. Traders are feeling Low, adjusting to Reality, hoping for a time when things will be Hunky Dory again. Alas, no Heroes are in sight. Perhaps once traders’ work is done, they’ll feel better Tonight. And there’s always The Next Day. Sorry, that’s the best David Bowie elegy we can scrape together on short notice. Your editor is a big fan, but I haven’t gotten around to listening to Bowie’s new recording Blackstar, released on Friday to coincide with his 69th birthday. It will be eerie to listen to it now, knowing it’s his last. RIP. Anyway, the Chinese stock market sold off hard overnight, the Shanghai Composite closing down more than 5%. But the selling didn’t spread westward; the major European indexes closed slightly in the green. That said, all the major U.S. indexes are modestly in the red as we write, the Dow off 20 points at 16,326. Other asset classes are not benefiting: Treasuries are selling off, and gold is struggling to hold onto the $1,100 level. The big loser, though, is crude. A barrel of West Texas Intermediate has now eclipsed its Panic of 2008 lows — down 4.5% at last check to $31.64. That’s a level unseen since December 2003. Are we the only ones who can’t summon any outrage about Sean Penn’s interview with “El Chapo” Guzmán, the chief of Mexico’s Sinaloa drug cartel? Sit tight: There’s a financial angle here. And not just the fact that at one time Guzman was on Forbes’ list of billionaires. We’re seeing bipartisan scorn today for Penn’s just-released Rolling Stone interview with Guzman while Guzman was on the lam. (He was recaptured last Friday.) “Maddening,” huffs White House Chief of Staff Denis McDonough. “Grotesque,” spits GOP presidential candidate Marco Rubio. Hmmm… Back in 2011, U.S. court documents revealed the feds worked hand in hand with Sinaloa for more than a decade to take down Sinaloa’s rivals. Then there’s the matter of the banking giant HSBC laundering Sinaloa money and getting only a slap on the wrist in 2012. “Yes, they issued a fine — $1.9 billion, or about five weeks’ profit — but they didn’t extract so much as one dollar or one day in jail from any individual, despite a decade of stupefying abuses,” said the gonzo financial journalist Matt Taibbi. The sweetheart deal was arranged by U.S. attorney Loretta Lynch — now the U.S. attorney general. It’s enough to make you wonder if Guzman is this generation’s version of “Ol’ Pineapple Face” Manuel Noriega — a Washington stooge gone rogue. Is Hugh Hefner becoming a trendsetter again in old age? Now, this is an increasingly common arrangement for owners who occupy commercial property — sell the property to raise cash but stay put and lease the place. That’s what Chicago Tribune owner Tribune Media plans to do with the iconic Tribune Tower in Chicago, for instance. But a private home? Maybe Hef is blazing the trail for millions of cash-strapped Americans during the next financial crisis — sell your home and stay in it as a renter. In light of what happened after the last crisis, we can believe it. “Look,” the reader writes, “the Amerikan naifs believe Washington, D.C., to be terminally inefficient and always ‘overbudget’ on virtually anything they touch with their collective communist-fascist thumb. Which makes really good cover for the form of greedy corruption known as ‘high crimes and misdemeanors,’ or simply ‘grand theft,’ by federal ‘public servants’ serving the Western mega-corporations who so efficiently ‘service’ us. “But please do not underestimate the Empire’s very efficient oligarchs in the area of ‘foreign policy and plunder.’ Gaddafi’s gold was on an outbound, spook-registered transport plane to Switzerland for redistribution to high-level, connected Western politicians and/or overextended Western banksters who front-load the massive naked shorts of precious metals necessary to keep the paper spot prices suppressed for the benefit of said Empire’s massive fiat money Ponzi scheme. “Murdered U.S. ambassador Christopher Stevens was up to his eyeballs in this transfer of weaponry to the terrorists. It should be obvious by now that D.C. (Langley?) wanted him out of the way. ‘Dead men tell no tales’? Hillabeast may be a psychopath, but she is very efficient. The 5: By now the transfer of the weaponry has been well documented, even if took place indirectly by way of Washington’s “good” jihadis in that part of the world. We’ll see what documentary evidence emerges with the gold — if any. “Love the ‘chart chimp’ chatter!” writes a reader on the subject of what we should call our trading specialists (and thank you for taking us away from heavy topics). “But I must say, the charts do not lie nor are they in a crystal ball formation. “I like reading charts, and I do not monkey with them! “And anybody can make predictions as long as they remember they are really just opinions! Nothing is certain! The 5: Love us or hate us, we’re just happy if you read! P.S. 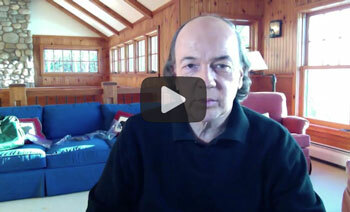 Absolute last chance: This Jim Rickards video comes offline tonight at midnight. We will not send you another email reminder this evening, so either check out the video now or miss out on it forever. Here’s the link.